The Listener returns May 29 | TV, eh? Following its most-watched season yet, CTV’s hit Original Series THE LISTENER returns with a mind-bending Season 4 premiere Wednesday, May 29 at 10 p.m. ET/PT on CTV and CTV Mobile. In the all-new season, which travels to Vancouver for the first time in the season premiere, telepath Toby Logan (Craig Olejnik) works hard to sharpen his police skills as a full-time Special Consultant with the Integrated Investigative Bureau (IIB). Also this season, Ingrid Kavelaars (WHISTLER) joins the cast as Nichola Martell, the ambitious new police superintendent. DOUBLE DATE… WITH DEATH, an original digital extension of THE LISTENER, will also premiere Wednesday, May 29 on CTV.ca/TheListener, CTV App, and CTV Mobile. Bell Media’s first digital series to feature broadcast tie-ins, episodes of DOUBLE DATE… WITH DEATH will roll out once per week concurrently with new episodes of THE LISTENER. With an impressive Season 3 average audience of 1.2 million viewers, THE LISTENER has achieved year-over-year audience growth every year since it debuted in 2009. The home-grown hit saw double-digit growth in Season 3 from Season 2 with A18-34 (+32%), A18-49 (+19%), and total viewers (+16%). Last season was also the drama’s most-watched premiere, finale, and overall audience on record for the series. 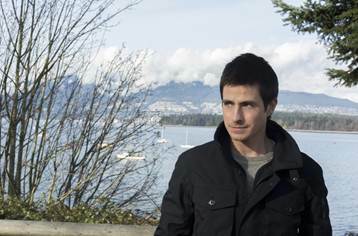 In the Season 4 premiere episode entitled “Blast from the Past”, Toby (Craig Olejnik) and Michelle (Lauren Lee Smith) are sent to Vancouver to investigate after a string of high-tech thefts spreads west. Toby is surprised when he crosses paths with his ex-girlfriend Lori Black (Jewel Staite, THE L.A. COMPLEX) who may be connected to the potential suspect. 2013 JUNO Award-nominated indie band Walk Off The Earth makes a special guest appearance in the episode. In Season 4, Toby’s personal life also heats up as his relationship grows with crime reporter Tia Tremblay (Melanie Scrofano, BEING ERICA), who is inexplicably the one person he can’t read. Life will be no less dramatic for Toby’s colleagues as Sgt. Michelle McCluskey struggles through a complicated marriage with her husband, while IIB head Alvin Klein (Peter Stebbings, MADISON) attempts to protect himself and his team from the political manoeuvrings of the ambitious new police superintendent, Nichola Martell. Meanwhile, new director of emergency services Oz Bey (Ennis Esmer, THE L.A. COMPLEX) realizes that being the boss is harder than he expected. Season 4 also welcomes a stellar list of guest stars including Justin Chatwin (SHAMELESS), Michael Filipowich (24), Michael Cram (FLASHPOINT), Gabrielle Miller (CORNER GAS), Erin Karpluk (BEING ERICA), Krystin Pellerin (REPUBLIC OF DOYLE), and Canadian mixed martial arts fighter Elias Theodorou. In THE LISTENER’s digital companion series DOUBLE DATE… WITH DEATH, series characters Oz (Ennis Esmer) and Sandy (Tara Spencer-Nairn) work with local reporter Missy (Stephanie Anne Mills, Come Dance with Me) to uncover the secret behind a “Jane Doe’s” death and the mysterious key she left behind. All clues lead to a deadly virus outbreak set to take place at a high-stakes ping pong competition. Mills makes her debut in the digital series premiere (May 29) before joining the broadcast cast in Episode 2. DOUBLE DATE… WITH DEATH is THE LISTENER’s second digital series following THE SWITCH, which featured Craig Olejnik and Ennis Esmer in a Season 3 companion series. Viewers can catch encore episodes of THE LISTENER Saturdays at 10 p.m. ET/PT on CTV (visit CTV.ca for local broadcast times), and Fridays at 9 p.m. ET on Bravo beginning June 7 (visit bravo.ca for local broadcast times). Following its television broadcast, viewers can also catch up on full episodes of THE LISTENER across CTV’s digital platforms on CTV.ca, the CTV App, CTV Mobile available on Bell Mobile TV, and through video on demand partners. The ensemble cast of THE LISTENER includes Craig Olejnik as Toby Logan; Gemini-nominated Lauren Lee Smith as IIB Sergeant Michelle McCluskey; Ennis Esmer as director of emergency services Oz Bey; Rainbow Sun Francks (STARGATE ATLANTIS) as Corp. Dev Clark, McCluskey’s computer maven partner; Peter Stebbings as Alvin Klein, the head of the IIB; and Tara Spencer-Nairn (CORNER GAS) as Sandy, Oz’s girlfriend and St. Luke Hospital’s triage nurse, who runs the floor with military precision. THE LISTENER is produced by Shaftesbury in association with CTV and Fox International Channels. The series is executive produced by Christina Jennings and Scott Garvie for Shaftesbury, and Karen Troubetzkoy (18 TO LIFE) and Peter Mohan (LOST GIRL, THE BRIDGE), who serves as Season 4 showrunner. Sharon Tal Yguado is Executive Producer for Fox International Channels. Tom Hastings and Rebecca DiPasquale are Production Executives for Bell Media. Trish Williams is Director, Independent Production, Bell Media and Corrie Coe is Senior Vice-President, Independent Production, Bell Media. Mike Cosentino is Senior Vice-President, Programming, CTV Networks, Bell Media. Phil King is President, CTV Programming and Sports. THE LISTENER is produced with the financial participation of The Canada Media Fund, The Canadian Film or Video Tax Credit and The Ontario Film and Television Tax Credit.